Jan is a fine artist, ceramic artist, illustrator, and professional calligrapher, to name a few of her talents. She holds a BS in Biology, and a Teaching Credential from Cal Poly Pomona. She holds a BFA degree in Fine Arts from the University of Utah. Jan teaches Pointed Pen Calligraphy at the University of Utah Lifelong Learning Program. She is a member of the Utah Calligraphic Artists Guild, and IAMPETH: International Association of Master Penmen, Engrossers, and Teachers of Handwriting. She enjoys botanical illustration, watercolor, oil, and acrylic painting. Bob Faught developed the biographical history timeline and family history timeline. He holds a BS in Psychology from the University of California Riverside and an MA in Psychology from Pepperdine University in Los Angeles. While Jan does all the artwork and calligraphy, Bob does the computer work for each order in Photoshop, Indesign, and Illustrator. Bob’s interest in timelines focuses on helping people document the biographical histories of particular persons or individual ancestors. 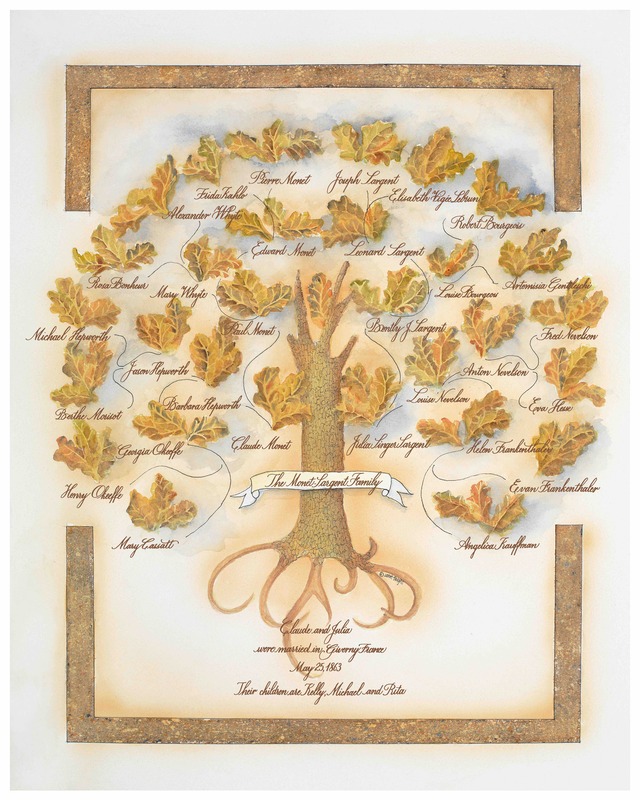 Our customized family tree is a unique fine art creation that a person or family can display in their home. Each family tree documents your family genealogy back four generations. Ancestor names are hand written in copperplate calligraphy by Janet for every customized family tree, uploaded into Photoshop, and placed on the tree in the proper place. The couple’s or individual person’s family name is placed in a banner across the trunk or at the bottom of the tree. In general, artwork is uploaded into Photoshop where photos and calligraphy are added, and the finished product is a 16×20 digital print on 17×22 cold press fine art paper. The print fits into a standard 20×24 glass frame. There are several designs from which to choose. The family trees that you can order directly are found on the main menu in Place An Order. All the tree designs are original art work by Janet. The family trees having no photos and only calligraphy, such as the tree below, are $55, while the family trees having fourteen or fifteen photos are $125. Family trees having thirty photos are $300 since photo restoration work is done on each photo. Included in your purchase is a computer disk with a pdf file of your tree for storage and preservation. In addition, your pdf file can be used to make printed copies of your customized tree. You can publish your family tree in a family story book, or send it to friends over the internet. Many families have their genealogy completed, but have no knowledge of their ancestor’s personal lives. 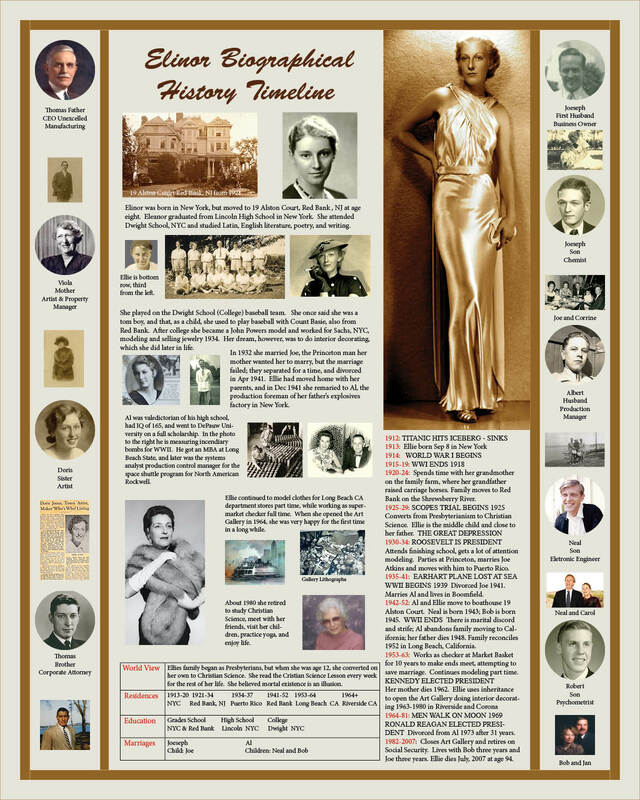 The Biographical History Timeline is a graphic way to begin preserving the memory of your ancestors on a single page. In its generic form, it includes a historical timeline, a life-storyline, a demographic table, and genealogy including parents and grandparents. It also documents the individual’s nuclear family including spouse, children, and siblings. The storyline provides a brief description of the most important four phases or aspects of the person’s life in chronological order. Each major life-phase is described with a brief written paragraph and at least two photographs. The historical timeline section, spanning the years of the person’s life, lists those important and meaningful activities that describe who that person is or was. Actual news headlines, included chronologically in the historical timeline, place the person within recorded world history. The demographic table lists, as best as possible, a history of the person’s worldview, education, residences, and marriages. The persons’s parents, grandparents, siblings, and nuclear family are documented with family photographs and dates. However, the below sample is just one way to organize family history into this format. We will work with whatever family information you have related to a specific person or a family. This is a back and forth process with Robert Faught using email and Dropbox.com. The biographical history timeline is a wonderful way to share your family history with friends and relatives, and to document the memory of family members for your descendants. As with the customized family tree, the customized biographical history timeline comes with a pdf file that can be used for publishing your timeline in a family book or publication. There are several different family tree designs to choose from. You can evaluate a design and place an order by navigating on the menu to “Place an Order.” Click on the design to enlarge and inspect the art work. We do not sell the artwork alone devoid of photos and calligraphy. When you have selected a design, then click on the BUY BUTTON. This will take you to PayPal where you can pay for the tree or timeline. This will begin the process on our end. Navigate on the menu to “Submit Ancestor Names,” and complete the electronic form, submitting the names required for the design selected. Janet will convert the names to calligraphy. Navigate on the menu to “Submit Photos,” and follow the instructions. Generally you can open a folder in DropBox.com for free, upload the required family photos, and then invite familytreesandtimelines@gmail.com to participate in the folder. You can communicate directly to us by using the email address above, or you can also navigate on the menu to “Contact Us,” and complete the electronic format provided. A custom tree or timeline will be constructed using your family photos and/or names. Your ancestor names will be hand-lettered in 18th century copperplate calligraphy by Janet, uploaded in Photoshop, and placed on the tree. Your ancestor and family photos will be repaired in Photoshop and enhanced and placed on the tree or timeline. A back and forth process where you receive proofs of the completed tree for evaluation is the next step. During this period we will communicate via email. You will receive the proofs in the shared DropBox.com folder for your approval. Upon approval your 16×20 custom family tree or timeline will be printed on 17×22 natural cold press fine art paper and shipped to you via UPS. It is recommended that you have the product framed in a 20×24 glass frame, keeping the product out of direct sunlight. In addition, you will receive a copy (.pdf file) of your family tree or timeline on a computer disk for archival storage, copying, and publishing. You can request 17×22 inch copies from us for $20 each.